Is Your UPS Store Listed On The Internet? 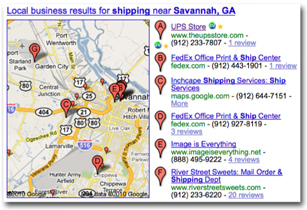 Quickly see if your UPS Store shows up on Google, Yahoo!, Bing, Ask, Superpages, Yelp, Local, Insiderpages and Yellowbook. Just type in your city, state and/or zip code to see the results. This really cool little tool will show you how you’re doing on all of these sites with the click of a button. Try it and send it to your UPS Store friends.